I am writing from the midst of a big city, full of crowds. Groups of older couples sit in the cafes, groups of young people of both sexes wander and laugh, couples too, gaze into each other’s eyes. But now and then there is a child, a little child, perhaps wheeled about. The eyes of the child are more wide open than anyone else’s – and particularly moving is the protective presence of the child’s father and mother, serving this precious little one, in whom is the future of humanity. Unlike the crowds, the children are utterly un-self conscious, and everything is fascinating. They are of course extremely vulnerable, but in their very vulnerability, they elicit a protectiveness, as it were, from the very universe. It is as if they were the most important people there. They are. 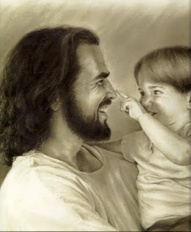 Our Lord tells us that unless we become as little children we cannot enter the Kingdom of Heaven: it is a most pointed teaching, a most clear teaching. We all have various roles to play in God’s plan for His Church, for God has given us various gifts. But the greater our gifts, the more we need to allow ourselves to be humiliated, to be thought little of, to be deemed failures or outcasts. The world selflishly keeps the attention of its children: God also claims the attention of His children, and He must wean us from our adult fixations – on ourselves, on each other – to where we can see again, see clearly, with the eyes of a child. We may have the most adult roles to fill, and yet our success in them, as Christians, will be proportionate to our ability to inwardly surrender all to God. To be vulnerable and wide-eyed, open to the God who does things we cannot imagine. Like the child in the marketplace. Like Jesus.